Vodafone Japan (Vodafone K.K.) recently announced a new range of handsets for Summer 2004, featuring models from the likes of Sharp, Toshiba, Mitsubishi and Sanyo. Frustatingly, all of these handsets are far more advanced than anything announced for the rest of the world and are exclusive to Japan only (although some may find their way out of Japan through specialist exporters). Of these, possibly the two most interesting handsets are made by Sharp. On the inside, the Sharp V602SH looks a little like the popular Sharp GX20 and Sharp GX30 models, with a slightly bland silver design. However, one of the first things you notice is that the large QVGA (320x240) pixel display swivels 180 degrees. OK, we've seen this sort of thing before, notably in the LG 7100 but this is Sharp's excellect 65,000 display as used on the GX30. The display works in this way partly to help with taking digital photos, but probably also because it's quite a cool thing to do. However, the clever bit with the Sharp V602SH is not the display, but the camera. It features a 2 megapixel autofocus camera and crucially it is the first mobile phone to come with a camera with a 2X optical zoom, which actually gives a better resolution than the standard digital zoom, which merely makes the pictures larger and more grainy. This is certainly a first as far as we know, and is a significant step towards a high-quality all-on-one mobile/PDA/camera device. This is a 2.5G device offering Vodafone PDC plus dual-band GSM support in a handset measuring 99x55x25 mm and weighing 132 grams - about the standard for a 3G handset. Memory can be expanded using SD memory card. and the V602SH comes with music playback, video support, 3G graphics acceleration for games, karaoke support, a dog bark translator and weather indicator. No, this isn't our April 1st story. 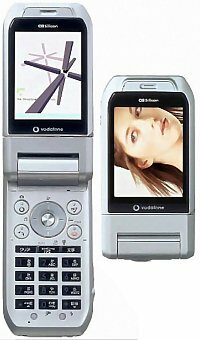 Certainly, not all the features in this phone will appeal to the western market, but you can expect to see the 2 megapixel optical zoom camera in worldwide handsets sometime in 2005 at our best guess. July 30, 2004 The new Vodafone V602SH from Sharp uses Toshiba's T4G OpenGL ES API acceleration chip. Only Java midlets can be run on this device. The 3D API available to the midlets is VSCL (aka JSCL) implemented by Hi Corp Micro3D engine layered on top of OpenGL ES. The Vodafone PDF press release describes the use of the T4G and Mascot Capsule in more detail.